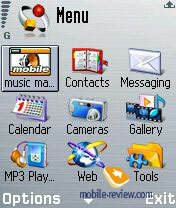 Samsung D720 happened to be one of the first Series 60 GSM smartphones by the Korean company. 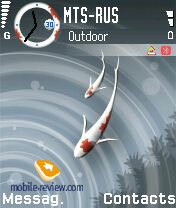 Traditionally, Nokia takes strong positions in the segment of smartphones on this platform. It is the very company to launch the most devices and bring innovations (you can see a complete list of Series 60 smartphones). Panasonic and Sendo are the ones to take less significant positions, each o them offers one model widely available on the market. In the nearest future Samsung will try to get wedged in this line. No one can call Samsung a newbie in smartphone manufacturing. More than two years ago the company announced its clamshell D700 and the D710 in a slider form-factor in 2004, which replaced simply not appeared D700. In the end, even the D700 was cancelled and two new models were developed on its base - Samsung D720 and D730, a slider and a clamshell correspondingly. The specs for the D720 do not really amaze, to tell the truth, it even remains two years behind the main rivals, which is due to long development. 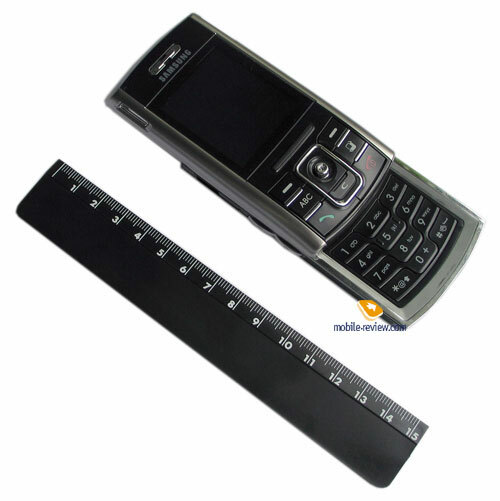 In fact, the base of the handset is a relatively old solution, Samsung D710. The characteristics of the model seemed interesting for the announcement moment in 2004, but it failed to appear on the counters. 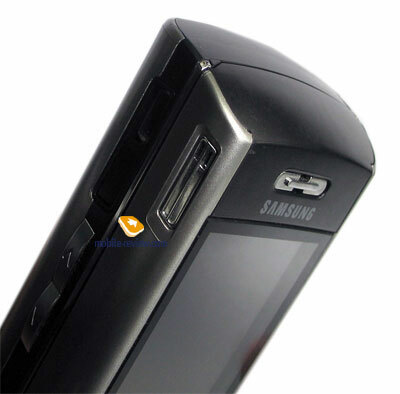 Then the company took Samsung D710 as a base for its Samsung D720 having slightly retouched the specs and design, and a bit later its variant in the slider form-factor called the D730. 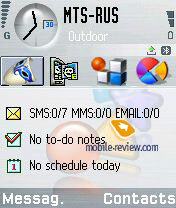 Durable development of the model (the basis was established two years ago) caused the lag in technical specs of the hardware platform Samsung D720/730 - no 3G/EDGE, relatively small screen, no Wi-Fi module, no 2MP cameras with autofocus, integrated hard drives, high resolution screens, old OS version (the service pack 2 brought one of the main renewals - support for WCDMA and video calls, they would have been unclaimed in this device). In other words Samsung's phones bring no innovations as Series 60 smartphones. Their strengths are the dimensions, weight, and form-factor. 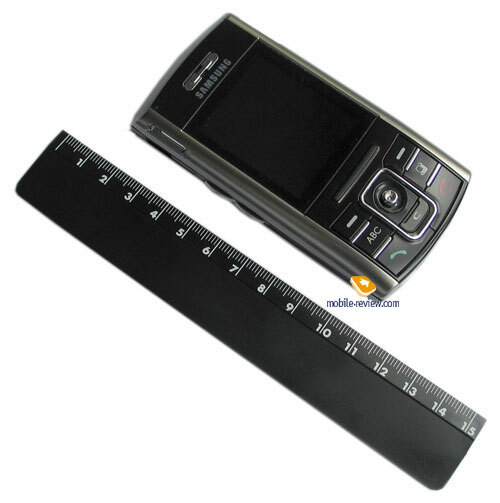 Thus, Samsung D730 is a clamshell, and there are not as many models in this form-factor on the market, they are Panasonic X700, Nokia 6260 and Nokia N90. 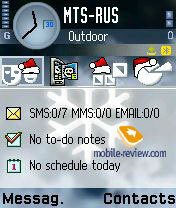 Motorola MPx200/MPx220 are indirect rivals on Windows Mobile. So, the choice is limited, and if speaking about the weight, then Samsung D730 is beyond comparison. And the selected form-factor makes a technically ordinary model seem interesting (for those who considers weight and size and prefers clamshells). Samsung positions slider models higher than clamshells, and correspondingly Samsung D720 is placed higher than Samsung D730, and will be $40-50 more expensive in retail. 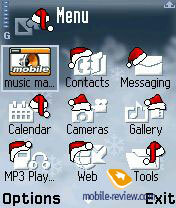 Only an old stager Nokia 7650 comes to mind when thinking about slider Series 60 smartphones. Now it's not actual on the market (Nokia N91 can be called a slider with some reserves, but the opening mechanism is quite another here). 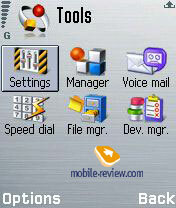 Indirect rivals on Windows Mobile are simply absent (HTC Blue Angel, HTC Wizard and Asus P515 communicators are not taken in account). 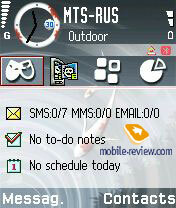 In that way, Samsung D730 just has no slider competitors, which is one of its main advantages. 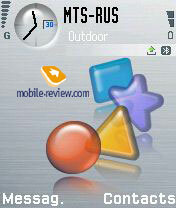 And we'll tell about it all in this short review, all the rest read in the review of Samsung D730. . The design of the D720 is rich in straight lines; there is no circularity peculiar to Samsung D500/D600. Generally the design is strict corresponding to business class. The body is of a high-quality plastic in black and silvery, the assembly quality is high (subjectively better than in Samsung D730). The smartphone is easy top open with one hand, just set against a rubber rest under the screen with your thumb and start the motion, the automatic finishing mechanism will catch up the motion and finish opening. And the same is with closing. The process causes no difficulties, but the mechanism itself is a bit rougher than in Samsung D500/600. 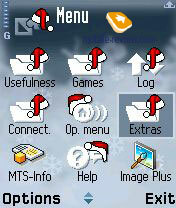 Surely, all the functions are available in a closed mode. The dimensions are 99x47x22 mm, the weight is 110 g.
The 5D joystick is very soft (pressing the device which lies with the face part on the table causes pressure in the joystick center), you should get used to it, especially in games. We don't claim to the buttons around the joystick, an interesting moment is in the standby mode all the buttons blink periodically, which replaces a light indicator (the function can be turned off in the menu), - quite an interesting solution. Number keys are smaller than in Samsung D730 and not projecting, but working with the keypad is practically as comfortable. 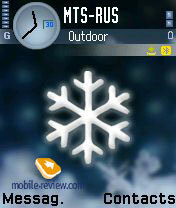 The keypad backlighting is even and well seen in all conditions. The elements on the edges completely copy Samsung D730. The thing to mention is they are not sunk into the body, and project like specially. They are pressed accidentally due to this (when carrying in a pocket, for instance), in the keypad is not locked. And a plastic shutter for the memory slot is better taken, it will never open accidentally. Two extra loudspeakers for volumetrical sound are on both sides. Really, nothing resembling this sounding is available, no stereo effect, though the sound is loud. Mush louder than in Samsung D730, which is an advantage. The screen diagonal is the same and forms only 1.83" (and at the same time a default standard for smartphones without a touchscreen is 2.2" or at worst 2"), the resolution is 176x208 pixels. The manufacturer claims 262K. Let's note the screen is much better than in Samsung D730 - it is brighter, more contrast and the picture looks more saturated. 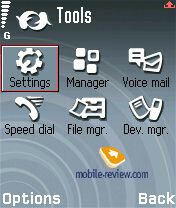 In the sun, the screen behaves acceptably, though the image fades completely, texts and icons remain seen. 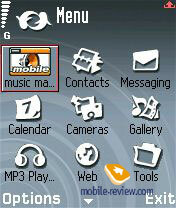 The commercial version of Samsung D730 is likely to have the same screen as Samsung D720 (then we'll renew the review). So, in the end we have a small screen with a middling quality for a smartphone. 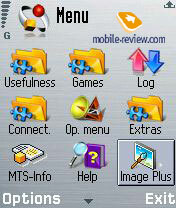 The last thing to mention is redrawn themes: the D730 provides with only standard angular icons, which are redrawn in standard themes of the D720, which makes the menu and screen quality perception better. 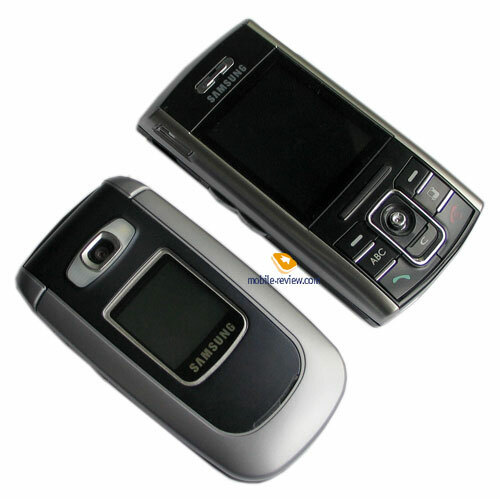 In general the collusions repeat the ones for Samsung D730 - the model is interesting for its form-factor and size. No revelations in technical characteristics.